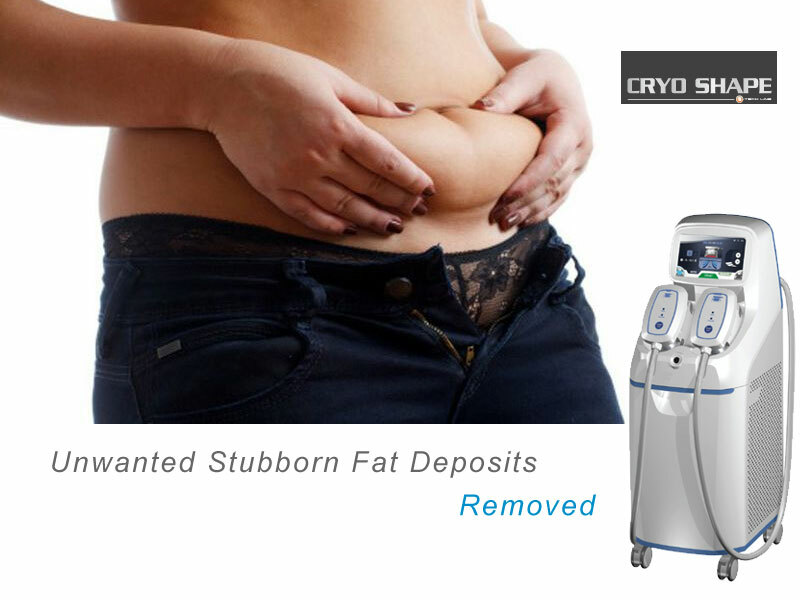 The new Cryo Shape uses cryolipolysis technology to cool unwanted fatty deposits beneath the skin, providing safe and effective body sculpting and fat reduction. Cryolipolysis is a fantastic liposuction alternative that enables us to freeze the fat cells, which your body then naturally processes and flushes out. Stubborn fat deposits are a common occurrence in many, and can be difficult to remove with exercise and healthy diet alone. A lot of people suffer with this issue, due to the natural distribution of fat cells. Some areas have more fat cells than others, making it increasingly difficult to remove unwanted fat in these places. Why is Cryo Shape considered? Surgery is uncomfortable and rather extreme, so it is understandable why many would rather not undergo if it is just a small pocket of fat you wish to eliminate. Many don't have time in their busy schedules to take time off to recover and heal therefore, further exploration into non-surgical options as an alternative, gives our patients as much choice as possible. Does the Cryogenic cool sculpting procedure hurt? The pack is applied directly onto the skin, however the surface is left unaffected by treatment and remains intact with a 95% patient satisfaction rate, this is a popular treatment which delivers effective results to get rid of unwanted fat. There are numerous benefits of having Cryo shape body sculpting treatment, not just the great results but also the elimination of surgery, anaesthesia and excessive downtime, as well as the longevity of the effects of treatment, also appeal to many. What areas can Cryo Shape fat freezing help? The stomach/abdomen, is one of the places on our bodies that can harbour stubborn fatty deposits. Stomach fat has multiple factors that can cause these deposits and worsen them, including your age, your diet, and even your genetics. Age is a factor that often causes our metabolic rate to decrease, this reduces how many calories we burn in a day. If we eat more calories than we burn over an extended period of time, the excess is stored in fat cells, which can swell to six times their size, creating the fatty deposits that are a source of contention for many people. Stress – the stress hormone cortisol can causes overeating, and eat ‘comfort foods’ that result in weight gain. High levels of cortisol have been linked to having higher levels of visceral fat (‘deep’ fat that is stored further under the skin and can be dangerous). Sleep – sleeping less than 5 hours a night can cause weight gain, as your body over-produces the hormone that tells you you’re hungry and under-produces the hormone that tells you when you’re full. Diet – processed food causes inflammation that limits the ability to lose belly fat, these include refined sugar, white bread, and processed grains. Genetics – body shape can make it harder to naturally lose visceral fat, especially for those who are ‘apple-shaped’, with a wide torso, broad shoulders, full waist and upper back. Love handles (also called muffin tops) are deposits of excess fat at the waist, often called stubborn fatty deposits, due to physiology; there are more fat cells in this region than in others. When you eat more calories than you burn the excess are stored by the body in fat cells, and become the subcutaneous fatty deposits that are a source of contention for so many people. Bingo wings are areas of flesh under the tricep on the upper arm that wobble, that are noticeable when the arms are raised and shaken. They can lead to self-consciousness and lack of confidence as people worry about their appearance. When weight is lost quickly, the skin is not given time to shrink back to its previous size, leaving stretched flesh that sags. Bra fat, the fat that bulges underneath/around a bra on the back, can be an area of self-consciousness for many women. It can be caused by ageing due to a change in how fat is distributed as estrogen levels change before the menopause. Repeatedly wearing ill-fitting bras can worsen how bra fat looks, which if you regularly consume more calories than you burn, the excess are stored in fat cells around the body. Women are more likely to overeat carbohydrates, increasing these fatty deposits. Ageing can also cause this indication; perimenopause in ageing women causes estrogen levels to change, which in turn causes fat to shift from the lower half to the abdomen and chest. Weak muscles can also contribute to factors; weak muscles in the back allow skin and fat to sag, creating the dreaded fat visible when wearing bras and swimming costumes. How Many Cryo Shape Cryogenic Treatments Will I need? Depending on your desired look, we usually advise 2-3 treatments however you can see visible results after just one treatment. Initially a free consultation would be required to ascertain which areas are required to have the treatment done and how many treatments it will take to achieve your desired look. The treatment takes approximately 45 minutes, meaning you can relax and unwind in our beautiful Bolton cryogenic clinic in one of our tranquil treatment rooms while the Cryo Shape works its magic on your desired areas. Complimentary refreshments and magazines will be available to ensure your experience with us here at My Face Aesthetics is an enjoyable one. How much does Cryo Shape cost? Cryoshape is £200 per treatment (two areas) and the recommended amount of treatments is 2-3 depending on your desired results. Why chose My Face Aesthetics Clinic for your cryogenic fat freeze & body contouring treatments? Here at My Face Aesthetics Clinic, we offer medical treatments you can trust. We have a small and friendly team who's main aim is to ensure each and every client receives the best possible treatment in our welcoming clinic situated in the centre of Bolton. The clinic is easy accessible via both car and public transport; Topp Way car park is just behind the clinic and the bus stop is right outside the front of the clinic. There is also a train station just a short walk away. We are also the only clinic in Bolton to offer Cryoshape which means our clinic is one of the first few in the North West to have this fantastic treatment available. Our Bolton Cosmetic Clinic specialises in quick and safe ways to reduce fine lines and wrinkles, through the use of Botox and Dermal Fillers to rejuvenate ageing skin. A wide range of proven clinical medical skin treatments inc a laser aesthetic clinic and a fat freeze Cryo Shape clinic are also available .